This Note discusses the relationship between enterprise value, growth strategy and risk management and explains how the CFO or the finance function can play an active role in enhancing the value of an enterprise. Without overwhelming our readers with details of mathematical formulation, we would point out that the value of an enterprise depends on two principal factors: its rate of growth and risk profile. These two factors are also interrelated as, for example, a company employing a high growth strategy may have to tolerate higher borrowing costs or risks of mechanical failures and human mistakes. It is however useful to look at the relationship between enterprise value and these two factors in isolation first before getting an insight into how the interplay of these factors determines enterprise value. Let us do this with a few simple graphs. 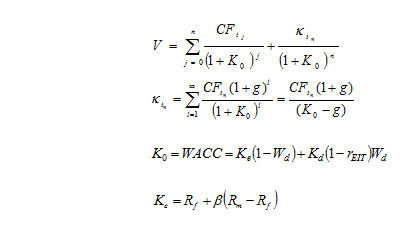 Those interested in mathematical derivation of the graphs may refer to the attached Schedules: (A) a breakdown of the factors, (B) formulas and (C) data set of the base case. 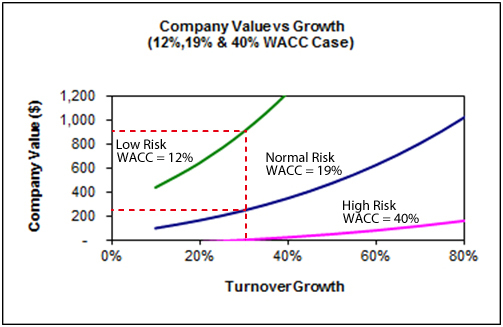 Graph 1 and Graph 2 show respectively the relationship of enterprise value with growth and risk measured with changes in cash flow ("CF") and the weighted average cost of capital ("WACC"). 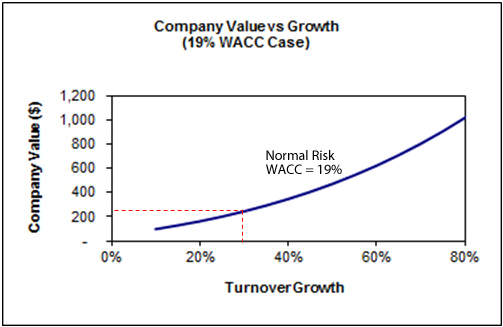 In brief, value rises proportionally with growth and drops inversely as risk increases. These observations correspond well with intuition. Note however that the change in enterprise value is much more sensitive to risk than growth. Further insight can be drawn when we look at Graph 3 that shows how one may choose a particular mix of risk profile and growth strategy to enhance the value of an enterprise. The moral of Graph 3 is that one should choose a relatively low growth strategy along with a low risk profile to produce the best result in terms of enterprise value. We can use the numbers as shown in the graphs to illustrate this point. Take Graph 1 and 2 as the base case. The enterprise in the example runs a strategy of growing at 30% with a risk profile of 19%. This strategy if effective produces an enterprise value of 236. 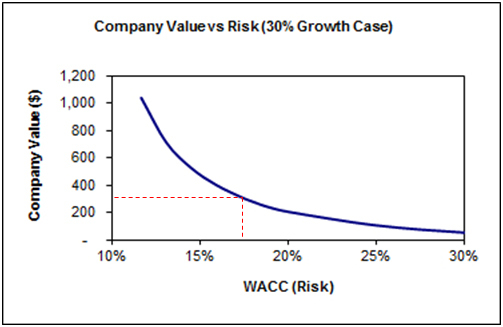 Graph 3 shows that the enterprise value can be greatly enhanced to about 900 by simply managing its risk profile down to 12% without changing its pattern of growth. On the contrary, if its risk profile is raised to 40%, the enterprise becomes valueless even if it can maintain or even enhance its growth pattern. This explains why some top global companies that we know regard cost control and risk management as a corporate function of overriding importance. The notion as explained is not difficult to understand but putting it into practice requires the enterprise to be able to manage growth and risk in a conscious manner, with sufficiently well ordered and good quantitative information in support. This Note advocates along with many, that it is the CFO or the finance function of an enterprise that should bear the responsibility of producing such information for the purpose of managing risk and growth and hence enterprise value. Why do we think so? One way to look at a business is that it is a value chain, a system adding value when converting inputs into outputs. Outputs are products or value propositions that customers are willing to pay for at a price. Thus the value chain is broadly speaking a production function that can be analyzed into smaller components: functions, risks, transfers and transactions. CFOs or accountants in their traditional role need to understand these functional components and flows, converting them into cost and revenue centers, with data collected and collated in a meaningful manner for financial, management and regulatory reporting purposes. Equipped with such experience and skill sets, the CFO or the finance function is thus in the most relevant position to produce information required for managing growth, risk and enterprise value. Accordingly the finance function, we would assert, is the key to modernizing the institution of an enterprise. 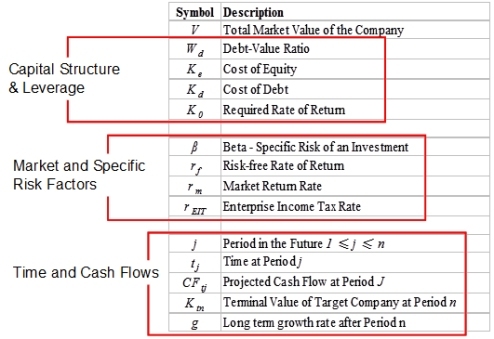 Engineering a finance function that fulfills its contemporary role is thus crucial not only for safeguarding assets, measuring performance and implementing controls, but also for enterprise value enhancement. Our next Notes will further explain.